Now that RFC 7151 has been published, (which defines the FTP HOST command), can WinSCP add support for it? Do you have a server that supports this, that I can use to test this against? Sure, I can set up an FTP site for you for testing; I'll send you a private email so we can set that up. It's more difficult to implement that I original hoped. This requires FEAT command to be send before authentication, so that HOST support is detected. Just a thought, but what a few FTP clients have been doing is adding an option to send the HOST command before logging in, or providing support for sending custom pre-login commands. 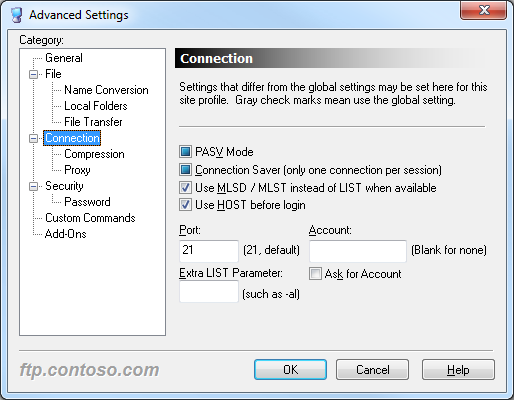 For example, in WinSCP's Advanced Site Settings, you could modify the Protocol Options page to add another text box for pre-login commands, or add you could an On/Off option to send a HOST command before logging in. Thanks for your suggestion. Do you know of any other use for "pre-login" commands, apart from HOST? I can't think of a reason for pre-login commands other than HOST. OK, I have implemented optional use of HOST command.